Home Beckons » Marcellus Shale – At What Price? The Marcellus Shale formation runs from the southern tier of New York, through central and western Pennsylvania, eastern Ohio, and through most of West Virginia. Hidden mainly 5,000 to 10,000 feet below ground level, the Marcellus slept relatively unnoticed for over 300 million years. Noticed and named just within the past two hundred years, geologists studied Marcellus and oilmen hungered after her. The rest of us unknowingly waited for an introduction. The early ones heard a knock on the door. “Hi, my name’s Mr. Gasman, and I work for Range Resources (or Chief Oil & Gas or Chesapeake Energy or a number of other companies). There’s a possibility of getting natural gas from the Marcellus Shale that runs through this area. We’re interested in leasing your land for gas and oil drilling rights.” Many people approached in the past to sell rights for five dollars an acre or less were now drawn in by new offers of $20 or $30 an acre. Money enough to paint the barn… Money enough to catch up on mortgage payments… Money enough to buy a new truck… Money I didn’t expect… Where do I sign? Gas. Natural gas. And lots of it. Known for years to contain natural gas deposits, Marcellus stubbornly refused to give up her stores until recently when technology and rising energy costs allied to work against her. 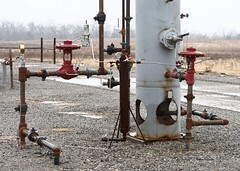 New horizontal drilling, proven effective in the Barnett Shale in northern Texas, offered the promise of finally extracting the before-untouchable Marcellus riches. Friends and neighbors suddenly learned a new vocabulary – hydrofracing, drilling mud, coalbed methane, shut-in, pooling, blow outs, rule of capture, delay rental, sour gas, recompleting, plugging back. Offers climbed to $100, $500, $1,000, up to $2,500 per acre in a little over a year, with added incentive of future royalties from producing wells. Good news, right? Well, maybe. Rather than a sense of excitement about the good fortunes coming to our country community, I feel a nagging sense of foreboding about this gas boom. The Beautiful Endless Mountains. The local Chamber of Commerce uses this phrase to snag tourists into our part of the Appalachians in northeastern Pennsylvania. Will that description still fit ten years from now? Besides the money, what will Marcellus bring to us and leave for us? Will our beautiful landscape be scarred with drill sites even after the drilling is done? What is the risk for fouling our air with methane or the rotten-egg smells of H2S? How many water wells will be polluted? Will the quantity of water required for hydrofracing endanger our local rivers, streams, and ponds? What happens to the contaminated wastes generated by the drilling? How much noise do drilling and well operations create? What impact will the drilling and wells have on wildlife? What will the total price be for our new-found prosperity? After refusing to sign last year, my husband and I will meet with Chesapeake Energy again next week to talk about our few acres. We’ll ask these questions, expecting to hear the upside and positive, while the real story plays out over the coming years. Will we sign a lease? I’m not sure, but whether we do or not, we’re sure going to get to know Marcellus.